An emotionally-charged ceremony for our Culinary Arts graduates! An emotionally-charged graduation ceremony took place on Friday, 10 June 2016, for our cuisine and pastry students. 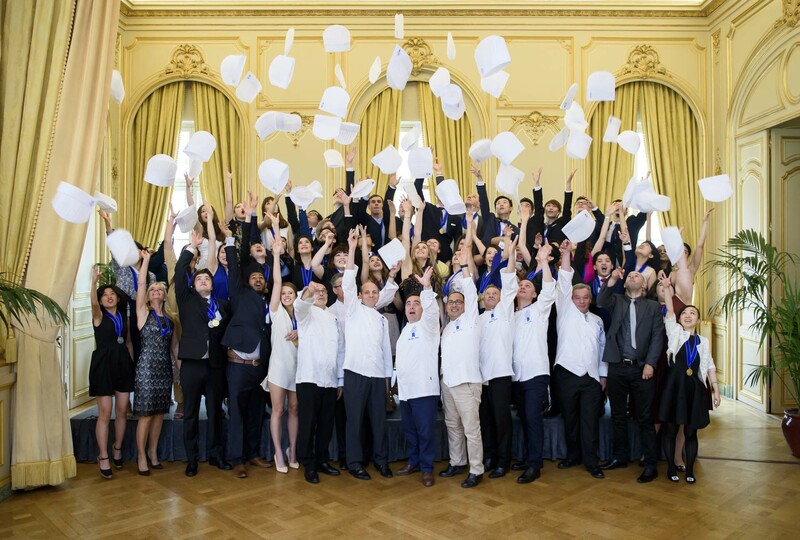 These are, in fact, the last ever cuisine, pastry and Grand Diplôme class graduates to have studied at Le Cordon Bleu Paris School in rue Delhomme. When talking about our patron for this session, I can say that he is someone who is very generous, and even in his way of teaching, because for him, a recipe is never just a recipe. And it’s undeniable that we have all been enriched by his knowledge. His creativity is unlike any other, he knew how to captivate us by the prowess of his demonstrations. We often say that a good teacher is one who transmits their passion and knowledge to their students. In this respect we can say without a doubt that your class patron, Chef Frédéric Lesourd has succeeded brilliantly. Not to be outdone were our pastry graduates. 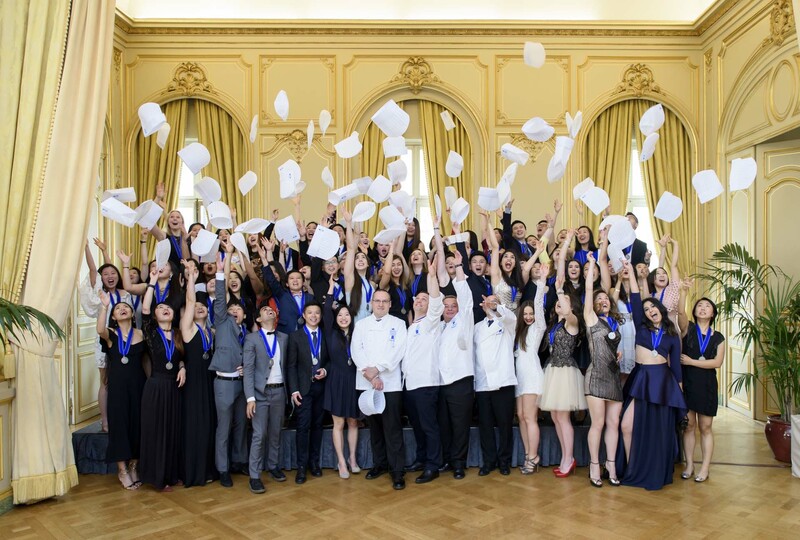 Their ceremony began at 2pm and they graduated cheered on by Chef Nicolas Jordan, One of the Best Craftsmen in France (Meilleur Ouvrier de France - MOF) 2015 – Ice and Ice Cream and Chef Instructor at Le Cordon Bleu Paris institute. Rigour, excellence and technicality are just a few words which spring to mind when thinking of this session’s patron, Chef Nicolas Jordan one of the best craftsman in France, or MOF. And these are the very things that he has been teaching to all students throughout his time with us here in Paris these past 5 years. He’s a man who takes pride in his profession, and has drawn much from his peers in order to give a vision to his art in pastry and ice work which is distinctively his own. If the most remarkable icebergs are sculpted solely with time, Chef Jordan has had the privilege, in addition to having been chiselled by the warm winds of passion, of being taught by the greatest, and above all been polished by his unswerving determination. With the support and applause of the Chefs who taught them their know-how and love of the profession, the new graduates are now ready to embark upon their careers. Le Cordon Bleu Paris institute team wishes them every success and would like to congratulate them once again. Future Culinary Arts classes will take place in the new Le Cordon Bleu Paris campus, located alongside the river Seine, with the first intake on 22 June 2016. This ceremony will leave lasting memories and brings another chapter in the history of Le Cordon Bleu to a close. Born in Paris, Chef Frédéric Lesourd obtained successive diplomas: a “Certificat d’Aptitude Professionnelle (CAP)” in both cuisine and restaurant management, a “Brevet d’Études Professionnelles (BEP)” and a “Baccalaureat Professionnel”. 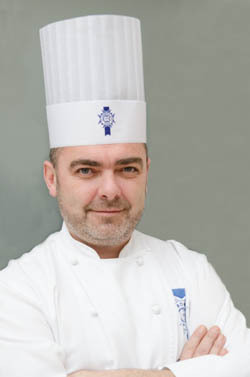 After receiving his diplomas, Chef Lesourd continued his training at well-known and Michelin starred restaurants and hotels in Paris; such as the Maxim’s, Le Bristol hotel, Le Prince de Galles restaurant Le Jardin des Cygnes, the Westminster’s Céladon, the Ritz hotel’s L'espadon and the Scribe's Les Muses. He held several different positions from "commus poissonnier" (fish cook assistant)“commis entremets” (vegetable and egg dish cook assistant), “chef saucier” (saucemaker chef) to finally reach the position of second "sous-chef" at the fine dining restaurant of the Meurice. 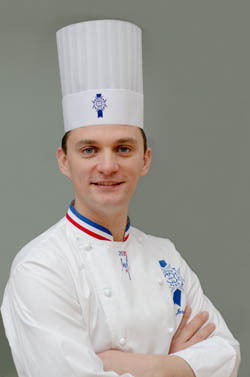 In 2003, Frédéric Lesourd became cuisine Chef for the Ministry of the Interior, before joining the team of the Élysée Palace (the Presidency of the French Republic). Chef Lessourd then became Executive Chef of Le W restaurant at the Warwick hotel. Chef Lesourd joined Le Cordon Bleu Paris team of Chef Instructors in 2008. Chef Lesourd is a member of the Culinary Academy of France, of Eurotoques, and of the “Disciples d’Auguste Escoffier” association. Born in Brittany, Chef Jordan obtained his “Certificat d’Aptitude Professionelle” (CAP) in pastry, confectionery, chocolate and ice cream making in 1995 after completing an apprenticeship in a “boulangerie-pâtisserie” (bakery and pastry shop). Chef Jordan then worked as a pastry Chef and Chocolate and ice cream specialist at Pâtisserie Lachuer in Vannes, France. In 2002, he was recruited to work at Restaurant Laurent, a two-star Michelin restaurant in Paris. In 2004, he decided to leave France for Canada and became head pastry Chef at Ottawa’s Le Moulin de Provence. He continued his career at Pâtisserie Rolland in Quebec before being employed as a Chef Instructor at Le Cordon Bleu, Ottawa. Throughout his career Chef Jordan has obtained numerous awards which bear witness to his talent. In 2010, he won the French Ice Sculpture Championship.In February 2011, he won second place in the National Water Ice Sculpting Competition in Andernos-les-Bains, just one month after winning the Frozen Desserts Open at SIRHA in Lyon. Chef Jordan joined Le Cordon Bleu Paris team of Chef Instructors in 2011. Chef Nicolas Jordan was part of the team that represented France at the World Pastry Championship in 2013. In February 2015, Nicolas Jordan was awarded the title of "Un des Meilleurs Ouvriers de France"- Glacier (One of the Best Craftsmen in France - Ice and Ice cream category), the ultimate consecration of his talent.